Locate The Most Beautiful Wildflowers By Using The North Woods Wildflower Identification Guide. This Ultimate Flower Field Guide Offers Over 72 Different Wildflower Options And Are Grouped By Color. Identify Wildflowers By Using This Guide Today! with simplicity and nature in mind. You enter a small glade in the forest. Wildflowers are in bloom everywhere. You are in awe at the natural beauty that surrounds you. Do you wish you knew what wildflowers you are looking at? The North Woods Wildflower Identification Guide is filled with 72 different wildflowers growing in North America today. Each of the 18 tags, measuring just 1 1/4” x 4”, are bound together on a ball chain that fans out easily for quick comparison. Two beautifully printed flowers are on each side of the tag. White flowers are grouped on the front side of the tags, colored flowers are grouped on the reverse. This convenient and simple design eliminates flipping through page after page of a traditional guidebook by grouping flowers by color rather than by species. Leave the bulky books at home, and order the most convenient, lightweight, durable and compact field guide available today! 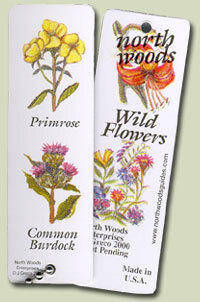 North Woods Wildflower Identification Guide $6.99 each, plus $3.95 s&h. you for your order ! !